Emirates flies to Cairo, capital of Egypt and home to the fabled Pyramids among much else. A city upon the Nile that has been inspiring humanity and drawing visitors since the dawn of recorded history, Cairo's one-of-a-kind allure is as alive today as ever. Cairo is a massive city with a long and well-preserved history of habitation that reaches back to the times of the Pharaohs, the Romans and the Greeks. The city almost resembles a pop-up book of architectural history with so many different period styles erected in a single space. 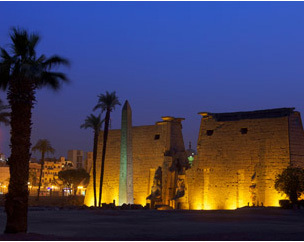 Awe-inspiring but also baffling, Cairo can challenge visitors. Noise and heavy traffic can be forces to contend with. First-time visitors uncomfortable with the local customs of bargaining and negotiable prices should make tour bookings and domestic travel arrangements prior to arrival, so that itineraries and costs are confirmed in writing. It may be tempting to dive straight into the antiquities, but a true visit to Cairo cannot be had without a healthy balance of the old and the new. An approachable starting point is Cairo Tower, a modern attraction whose fantastic views give visitors a sense of the size and general layout of central Cairo. An important facet of both contemporary and historic Cairo is the coexistence of the world's three dominant monotheistic religions. This is perhaps best witnessed with a visit to Islamic Cairo and Old Cairo – ideally, within the same day. Make your way from the mosque of Ibn Tolon to the Coptic 'Hanging' Church to the Ben Ezra synagogue to gain a first-hand view of this delicate, but inspiring balance. However, the handful of ancient sites that are found in Cairo happen to be some of the most famous; and no matter how overcrowded or surrounded by tourist traps they may be, visiting the Sphinx and the Great Pyramids at Giza will never be a cliché. Most surprising, is that for a small fee one is permitted to actually enter the ancient pyramids through dark, steep and narrow tunnels – claustrophobics and less agile climbers take note – and stand deep within a hollow in their mysterious interiors. This makes for a truly unforgettable experience; however, visitors should be warned that entrance is not always available due to regular maintenance and upkeep. To experience authentic fare in Cairo, head to the ubiquitous street cafe to sample three popular Egyptian dishes: foul medammas, koshary and falafel. Vegetarian and filling, these grain and legume-based dishes will help get you through a busy day. For more sophisticated dining, try a dinner cruise on the Nile. Take your pick among several large river boats – these typically offer several hours of floating up and down one of the most famous rivers in the world, multi-course dinners and live entertainment. For a more private dining experience, pack a picnic and rent a felucca, a small wooden sailboat complete with a skipper, and enjoy a few hours of serene pleasure cruising on the breezy Nile. Cairo's nightlife is abundant. Egyptians stay up late, so the city's restaurants and bars tend keep their doors open until the early morning hours – and some even stay open all night. If you seek musical entertainment, try the Cairo Jazz Club, Cairo Opera House, or the El Sawy Culturewheel for live performances from both Egyptian and touring international artists. Cairo may be the capital of Egypt, but there is an abundance of exploration and adventure to be had beyond the city. Those looking to further their pharaonic exploration should opt for a journey to Luxor and Aswan where many great temples and monuments are found. Alternatively, head north to the famous Mediterranean city of Alexandria to explore one of the world's oldest libraries. Most of the original was destroyed by fire centuries ago, but the site itself has been restored into a large and impressive modern library with an expansive collection of worldly texts and several showcase areas presenting a variety of regularly-changing exhibits. For a beach vacation or some world-class scuba diving, take a domestic flight to Sharm el-Sheikh. Located on the Red Sea, this is a popular resort destination for European holidaymakers, and the corals and underwater life found among the reefs here are some of the finest on Earth.